1184 hold up well, now testing 1189 area . Now will need to move above 1192. (Careful with zig-zags at 93 resistance) for 1197 and 1201 objectives. Failure to stay above 1192 will target 1186 again and possibly retest of today's lows. ES trading now 1191.00 @ 14:14 E.T. 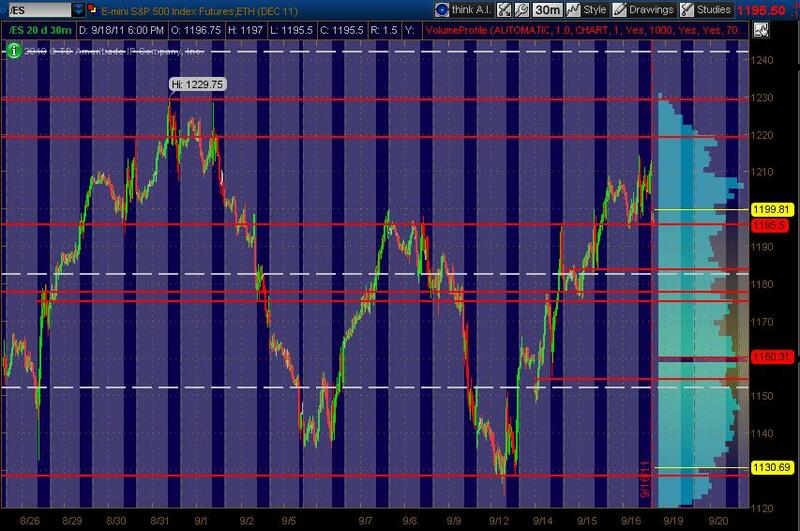 Sorry, ES is now trading at 1191.75 @ 14:22 E.T. Al, can you define open? 9:30 or hr by hr? ES hit 93.50. Small Zig-zags here with 91 as support. 1196 is the objective if 91 holds. Possibly 1201 by the end of the session. ES now trading 1193.00 @ 14:50 E.T. The DX looks VERY weak.. If it can hold below 77.50 for 15min, that is a C down day which is very bearish.. If it happens, the ES can move significantly higher but thus far, it has not happened yet.. If the ES holds above 95 for 10 min, I'm looking for long entries..
what do you mean by open to open?? I'm not following your method.. Is the open from hr to hr? Who's game?